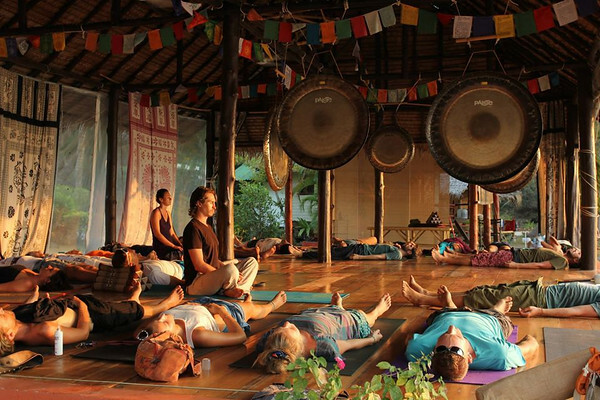 Samma Karuna is an awakening and healing school located in Koh Phangan. We offer classes for enhancing the body, mind and soul. Samma Karuna is an international mindful community for people who want to learn to live a happier more fulfilled life based on self-improvement and personal development. Our peaceful center is nestled amidst lush jungles and white sand beaches on the tropical island of Koh Phangan, Thailand. It provides an ideal environment for personal development and healing body, mind and spirit. Our mission is to cultivate a lifestyle that develops inner growth. Within the Samma Karuna community, we are actively engaged in learning from each other. Our unique program offers meditation, yoga, estatic presence, life coaching, mindfulness practice, tantra, bhajans, compassionate sharing, retreats, workshops, and much more. With support from the community and guidance from the staff, each individual develops their own action plan that enables them to discover their true potential and enjoy a more fulfilled life. We also offer both long- and short-term volunteering opportunities for those who would like to support our work. You are also welcome to visit as a guest, where you can relax and join our activities, and learn more about our school.